- CHIKARA Eighth Show (October 26, '02) = Roxx lost a "Kiryoku Pro Showcase" Match to April Hunter. - NECW All-Women Tournament (June 5, '05) = Nikki Roxx defeated Cindy Rogers and Violent Flame, before losing in the finals to Mercedes Martinez. - RoH Black Friday Fallout (November 24, '06) = Roxx lost a "Four Corner Survival" Match to Lacey. Allison Danger and Daizee Haze were the other participants. - RoH Reborn Again (May 11, '07) = Roxx lost to Daizee Haze. - SHIMMER Title Tournament (June '07) = Roxx beat Rain, then fell to Lacey. - TNA Bound For Glory '07 (October 14) = Roxxi Laveaux competed in the "Knockouts Gauntlet" to decide the first TNA Knockouts Champion, which was won by Gail Kim. - TNA Genesis '07 (November 11) = Laveaux lost a "Four Way" Match to the TNA Knockouts Champion, Gail Kim. Angel Williams and ODB were the other participants. - TNA Turning Point '07 (December 2) = Laveaux & ODB fell to Angelina Love & Velvet Sky. - TNA Destination X '08 (March 9) = In a dark match, Laveaux defeated Angelina Love. - TNA Lockdown '08 (April 13) = Laveaux won a "Queen of the Cage" Match over Traci Brooks, Christy Hemme, Jacqueline, Rhaka Khan, Angelina Love, Velvet Sky, and Salinas. 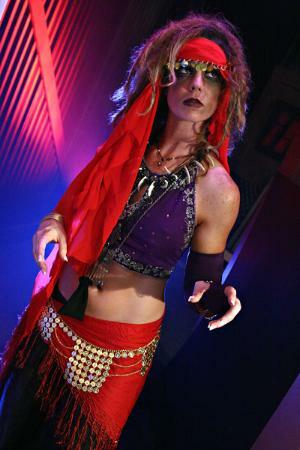 - TNA Sacrifice '08 (May 11) = Laveaux competed in a "Knockouts Makeover" Match, making it to the final portion before losing to Gail Kim. Due to the loss, Laveaux had her head shaved. - TNA Slammiversary '08 (June 8) = Laveaux, Gail Kim, & ODB defeated the Beautiful People (Angelina Love, Velvet Sky, & Moose). - TNA Bound For Glory '08 (October 12) = Roxxi lost a "Three Way" Match to the TNA Knockouts Champion, Taylor Wilde. Awesome Kong was the other participant. - TNA Turning Point '08 (November 9) = Roxxi & Taylor Wilde defeated Awesome Kong & Raisha Saeed. - TNA Final Resolution '08 (#2) (December 7, '08) = Roxxi, Taylor Wilde, & ODB won over Sharmell & the Beautiful People. - TNA Genesis '09 (January 11) = Roxxi, Taylor Wilde, & ODB defeated Sojourner Bolt, Rhaka Khan, & Raisha Saeed. ODB, by getting the pinfall, became #1 Contender to the TNA Knockouts Title. - TNA Destination X '09 (March 15) = Roxxi, Taylor Wilde, & the Governor defeated the Beautiful People (Angelina Love, Madison Rayne, & Velvet Sky). - TNA Knockouts Tag-Team Title Tournament (August/September '09) = Roxxi & Madison Rayne fell in the first round to the Beautiful People (Angelina Love & Velvet Sky). Taylor Wilde & Sarita won the tournament. - TNA New Year's Knockout Eve Tournament (December 31, '09) = Roxxi took down Velvet Sky, then lost to Hamada. ODB won the tournament. - TNA Slammiversary VIII (June 13, '10) = Roxxi lost a "Title vs. Career" Match to the TNA Knockouts Champion, Madison Rayne.